I can’t believe the mini is over. I enjoyed the past eight weeks so much, and I can’t imagine switching gears to a new discipline. The final project really inspired me and motivated me to keep learning and to push my ideas further. I feel very passionate about the work that Gilly and I did, and I think the project overall was a success. The last time we had a critique, we had just come to the idea of Shuffle. We were really excited about this development because our previous idea of sustainability felt too disconnected from all the work that we did concerning the studio layout. We got a lot of feedback and we felt a little overwhelmed with the amount of ways we could go and the amount of time that we had. If we had had more time, I would have loved to continue to iterate and expand on the collaboration aspect. I would have also loved to refine the interfaces a bit more. It also would have been nice to have had the opportunity to change the studio layout a couple more times. 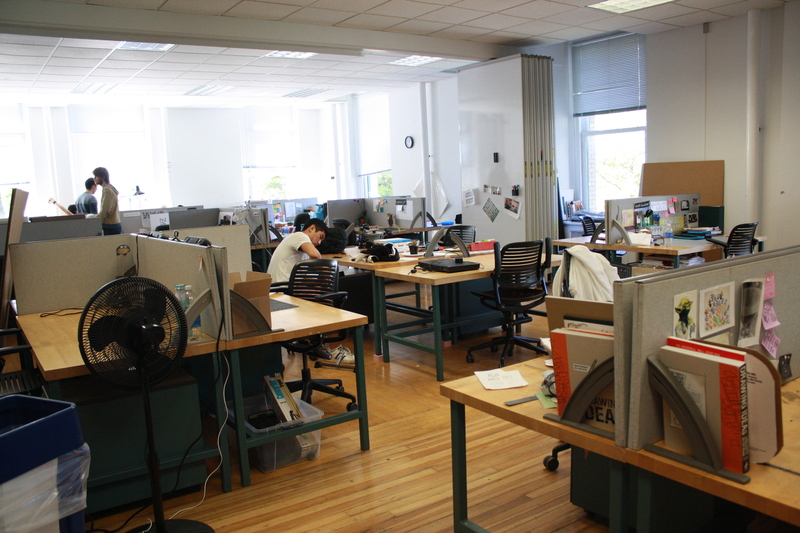 We didn’t really get to experiment with desk sharing or removing all the dividers. I learned so much from this project. I saw how real-time feedback from your peers is extremely informative. I also experienced how hard it is to please everyone. Besides the differences between how everyone works, other students had their own ideas about what would be the best studio environment. We realized that usually people express a very idealistic idea of what they want. It was up to Gilly and I to evaluate what was practical and within scope. However, we got a lot of good feedback from our peers and a lot of aspects that people enjoy about the new space are things that were mentioned to us by one of our peers. Listening to your users is integral in the design process. I am really glad that we got to work with an environment that we had access to 24/7 because it allowed for a greater understanding of all the environments in studio. It became more than a place to work; studio became a place where we had a heightened sense of what was happening and what everything meant. We could experience and react and build off of that learning. I am so grateful for that experience. I have never been so immersed and aware of where I was before. I think we had a really successful concept. It got a lot of people’s attention and solved a problem that everyone in studio was experiencing. We really wondered why software like Shuffle doesn’t already exist; it would have pushed our layout redesign so much further. Even though we can’t actually use shuffle, I think it opened up my eyes to how important the layering of information is. You can miss a lot of connections by not looking at your data and notes and observations and paying attention to where they overlap or disagree. Our usage of the velcro was also very successful. Gilly and I immediately noticed the difference in our work habits; we started prototyping much more rapidly and quickly started to understand what wasn’t working in any of our layouts and what we hadn’t fully explored yet. I really saw the value in physical prototyping through this project. It was so much more informative to me on an intuitive and subtle level. Using the software was extremely challenging. SketchUp and Depthmap gave us so many headaches. We spent a lot of time trying to get around the obstacles we encountered. Even after this frustration inspired us to create Shuffle, we still had to deal with it in order to fully communicate our final deliverable. We struggled with hardware too like the projector and getting the right level of brightness that would show up in our video. One thing I would definitely do differently is experiment more with the different projectors we were given because I think the one we used seemed to have a bad lightbulb when you compare it to the quality of the SketchUp animation in the video which was significantly brighter and was projected from a separate device. However, time got in the way of us further exploring this issue. We started on the Shuffle idea and video late in the game since we spent so much time rearranging the space which turned into two or three weeks of research that led to the creation of Shuffle. There definitely wouldn’t be Shuffle without our own physical studio exploration. Next time for our presentation I think I would have liked to plan a little bit more for the presentation. I needed more practice concisely explaining the concepts and our process work. I am really excited to submit our project to a design competition. I am very passionate about our work and the concept, so I am confident that it will show through our documentation and process. This semester has been an unbelievably fast paced and intense eight weeks, but I have learned so much. This last assignment especially was an incredible growing experience for me and I am so grateful to have completed it. I am really happy about the layout that Gilly and I came up with. I think that everyone felt a lot better about the environment that we created compared to last time. All the problems that we solved last time stayed solved and a couple of areas were improved. The space between the studios that is created when the wall is open is great for large scale prototyping and helped a couple students create prototypes for class. The people who felt that they were in isolation did not feel isolated in this layout. Privacy also increased for the people who felt that last time they did not have a personal space any more because of their desks orientation. I noticed that my desk blocked my vision a bit, but we increased visibility for a majority of students. And an added bonus was that we made the students in the other studio happy as well. They were enjoying the extra space and communication just as much as we were. If we make any more changes to the space, I think it would just be concerning the dividers and seeing what happens when we remove more of them. From the critiques that we got from Peter and Austin, we walked away knowing that our focus was going to be solely on rearranging space. While the sustainability aspect was really interesting to both of us, we need to narrow our concentration. A lot of great directions were brought up about how we can create a digital or hybrid environment that supplements the physical space. I think we should stay away from mobile applications and try to combine SketchUp, DepthMap and physical modeling and prototyping to optimize ideation. Gilly and I redesigned the studio space again. 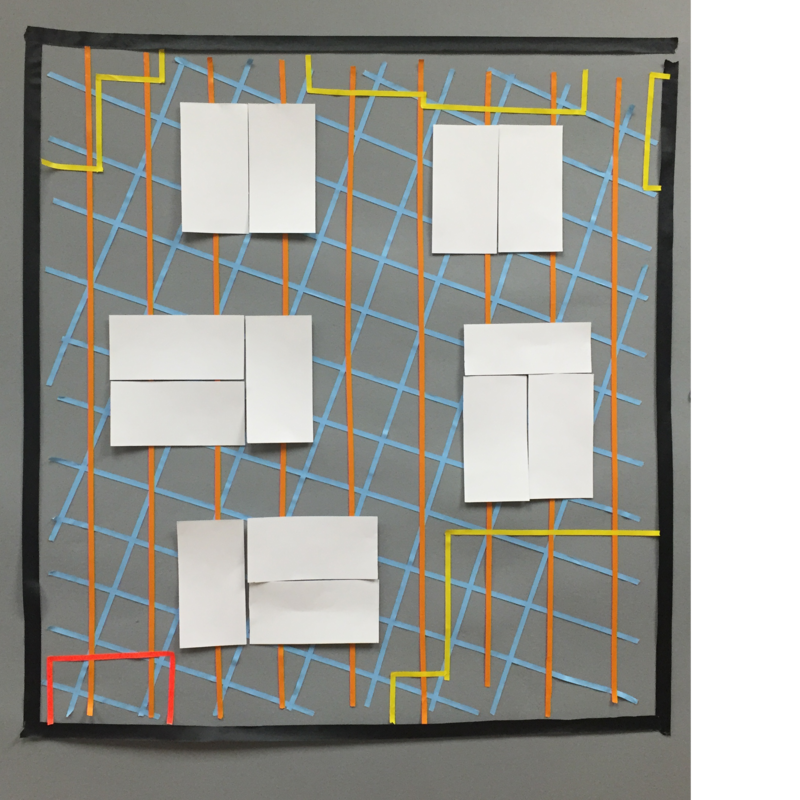 We took a different approach by creating two spaces, one with dividers and one without. We also began looking at different interfaces to help with our narrative. Gilly and I were really excited about the results from actually moving furniture in studio. We tried a couple of layouts, making sure that we were solving the immediate issues with the bicycle racks and relocating the crit space. The main obstacles we ran into were giving everyone enough space around their desk to sit and work comfortably and creating a flow so people can walk and move about easily. I think with the amount of space we have and the size of the desks, this is going to be a challenge no matter what. The aspect of the new layout that everyone liked the most was actually something that we did not really change. Gilly and I opened up the whiteboard wall between the two studios, and the atmosphere completely changed. Everyone was so excited about the increase of light and the openness. I think that everyone was feeling a little too cramped and turning the two studios into one open space has made everyone feel more at ease. We really don’t have a lot of space for the amount of people in C and E. It doesn’t help that our desks are so big either. A lot of space is also lost from having the white board wall in the middle. I hope the new layout will give everyone a bit more space. Moving the critique to the middle of the room highlighted the fact that a lot of people are not paying attention during crits. I really want to create an in class environment where people have to pay attention when a critique is going on. We also need to think about our sustainability narratives and to enrich those. That will be our biggest challenge since we don’t have a lot of access to the technology. However we will focus on starting to increase awareness and starting conversation. Gilly and I rearranged the studio space. We hope to get a lot of feedback from our peers about what they are experiencing. We also constructed some narratives inspired by our conversations with Azizan. The meeting that Gilly and I had with Azizan Aziz went very well, but we have a lot to think about going forward. 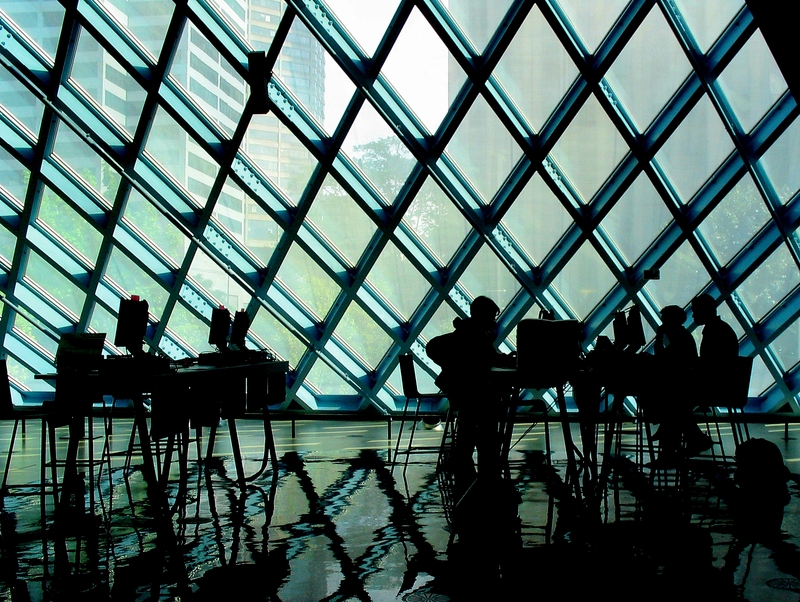 We don’t have enough time to implement what is implemented upstairs in the Intelligent Workplace, but we can create a plan for how monitors and sensors can be incorporated into the space. I think we need to focus on starting a conversation between people in studio about our consumption. Increasing awareness is the first step to making sustainability a priority. Azizan showed us some charts of heating and cooling in office spaces and explain to us how those visualizations of data can help to quickly and accurately pin point problems in the system. We think that this could be a great way to communicate consumption issues since everyone in studio responds well to visualized data. Going forward, Gilly and I will first attempt to change the layout of the studio and get feedback from our peers. We want to try to solve some issues with manual changes before thinking about the technology that will supplement later. Gilly and I worked together to brainstorm a new layout for studio. We also contacted Azizan Aziz from the Intelligent Workplace Program, and scheduled a meeting with him to discuss some ways in which the design studios can become more sustainable and aware of its consumption. I am really glad that I got to experience the Carnegie Library. It is a beautiful building with a wonderful environment. I can tell that the needs of the user were kept at the forefront. I was really inspired by the accessibility of the library and all of its resources. It is definitely a place that I will be spending a lot more time at. This made it really hard for me to design for the library. I had a really hard time finding flaws. I enjoyed wandering through and discovering new spaces, and at first, I did not think that that was something I needed to change. I am glad that I made the decision to highlight that experience. I felt passionate about creating a narrative around the whimsy and curiosity. 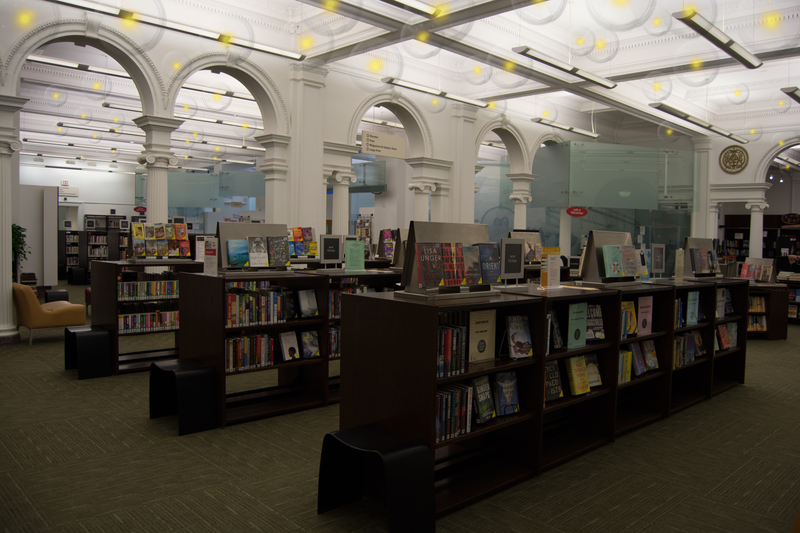 One issue with the Carnegie Library was the limited hours of operation. It was really difficult for me to find time to go and analyze the space before class. I wish I was aware of this earlier so I could plan accordingly. I took a risk with my addition to the Carnegie Library’s environment. A great point made in discussion though was that I had to start somewhere, either at a small scale to develop later or at a scale that pushes boundaries that must be refined later. I pushed the boundaries with my idea; I jumped into the concept without knowing what technology could fulfill it. I see why that’s good and bad. It’s good that I was pushing technology and trying to create something totally new. However, if this was a real proposal, I don’t think my concept would be chosen because there are too many unknowns. This would be a great point in my process, but to fulfill the point of the proposal, i want to see what technology is out there and come up with a plan that could be realized. Going forward I need to keep in mind these questions: What’s too much? What’s enough? And is it worth the cost? I’m not sure if I was totally convinced about the value of my idea, and I think it was apparent during my presentation. I really wanted to create something that would not ruin or hinder the library as it is now. One thing that was missing from my concept was the lack of an interactive element. I think that crossing the line of involving the user is what gets the project from an art installation to environment design. Questions I want to consider going forward: How does it relate to individual users? How does it relate to the environment as a whole? What information do you receive from it? What happens with that information? I found the sound spotlight concept that Austin suggested to be an interesting direction. Having extra sound might detract from the quiet environment, but I think that the idea of pinpointing an output to the specific location of an input would be fantastic at accommodating multiple types of users. I chose to create a light installation in the Carnegie Library. I wanted to enhance the environment by adding a whimsical, unobtrusive element to exist with the beautiful architecture. 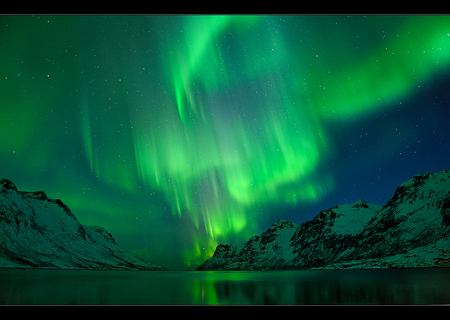 The name “The Carnegie Lights” comes from the Northern Lights (also known as Aurora Borealis), which is an awe-inspiring natural phenomenon. 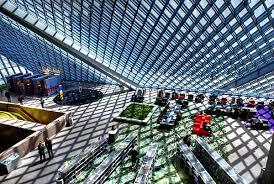 I was inspired by the Seattle Public Library’s use of pattern and repetition. 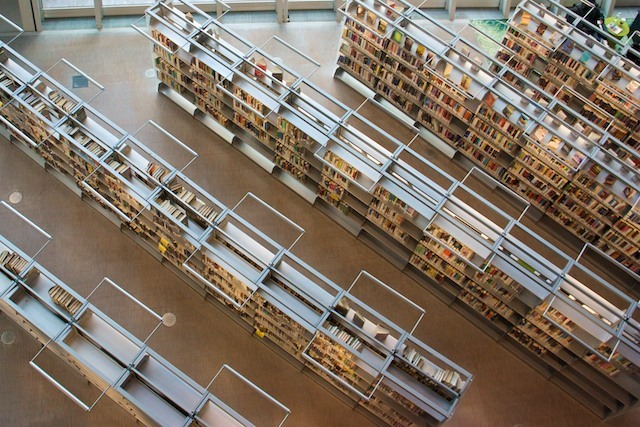 The library is a fun, exciting space that people want to experience time and time again. I started my research by looking at different examples of kinetic light sculptures. I had to be careful though because I did not want to compete with the architecture of the building. 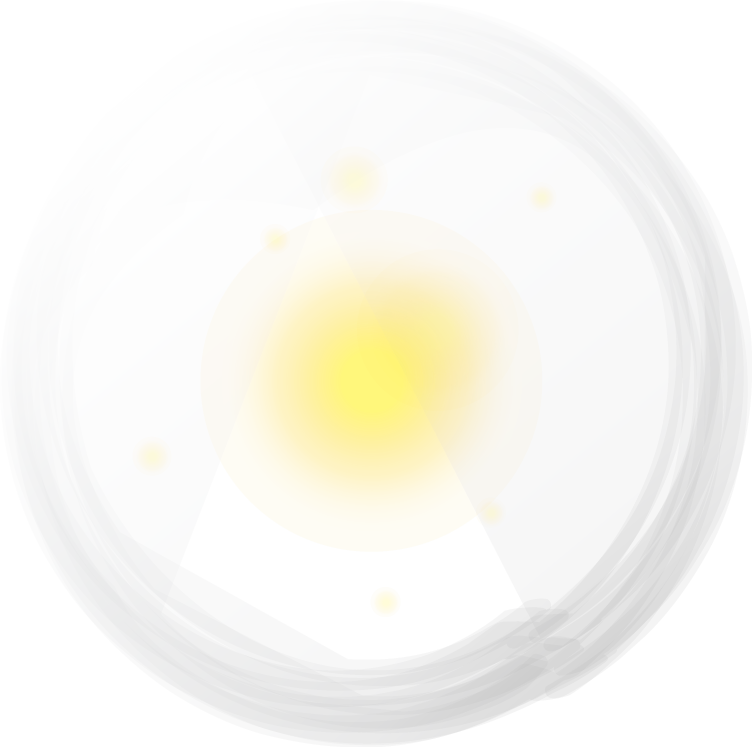 So, I designed a transparent, hovering orb whose light would pulse and whose movement would slightly rise and fall. The tone I wanted to communicate was calm and curiosity. I really enjoy the current environment of the library, so it was difficult for me to think of something new that could improve it. However, I was really surprised at the emptiness of the library, so I felt that an installation like this would become an attraction and highlight the importance of public libraries in our society. 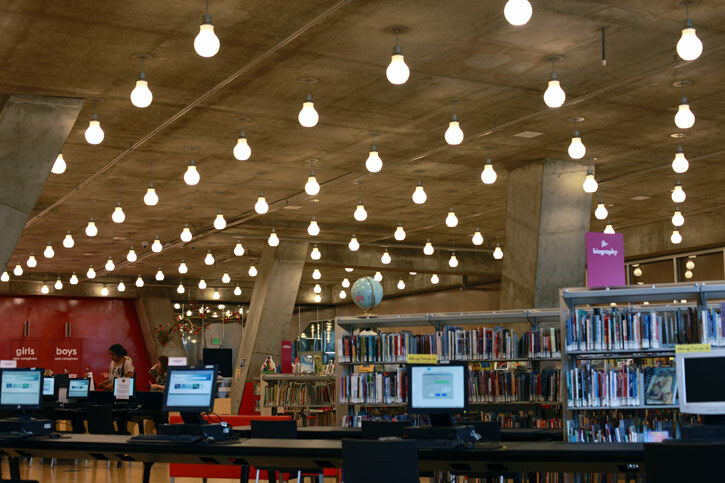 The lights communicate the tone of a library. They are very quiet, but they also have an underlying tone of wanderlust and discovery.